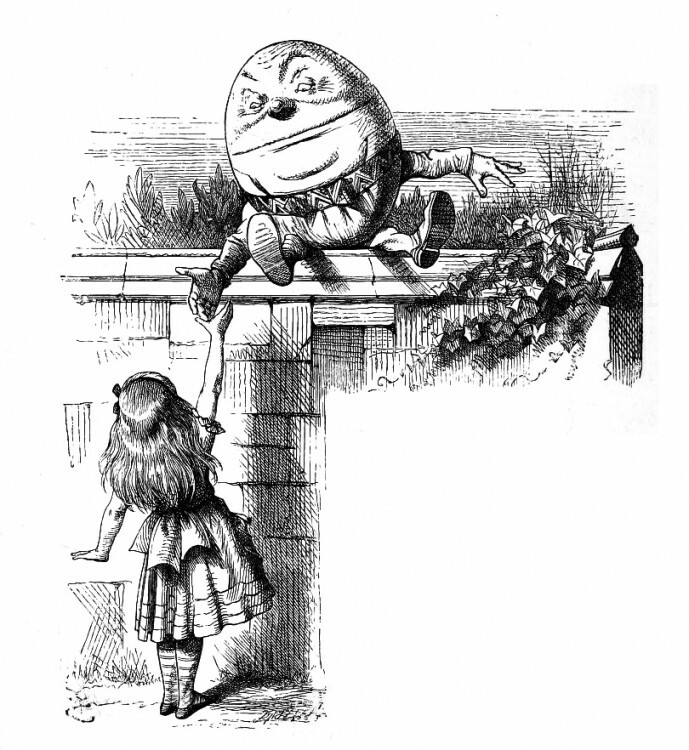 When Alice meets Humpty Dumpty in Alice in Wonderland, illustrated here by John Tenniel, they have a famous exchange of views about the meaning of words. Humpty Dumpty appears to be leading the public discourse on migration right now. The words we choose to talk about a subject are always a significant window to our position on that subject. In the past few weeks, as they report or comment on the thousands of people attempting to find a new life in Europe, newspapers and politicians have fallen back on rather predictable language. There is, of course, the use of words associated with water – from the relatively mild ‘flow’ to ‘streams’ of migrants threatening to ‘flood’ our European countries, ‘tidal waves’ of migrants’ (Daily Mail, 26 June), ‘tsunami of Christian migration’ (Breitbart, 3 September) and ‘inundated with migrants’ (CBS, 26 August) – all of which, in their insensitive references to drowning, express concerns about the host nations rather than the people in actual danger of drowning as a result of the insecure, overcrowded and unseaworthy boats in which they make the journey across the Mediterranean. Then there are the references to animals and insects – not just Katie Hopkins’ ‘cockroaches’ but also the Prime Minister’s ‘swarm of people’ (30 July) – terms redolent of infestation and destruction. The extent to which this is a situation out of legal control is conveyed in the use of words associated with criminality, most notably ‘marauding’, applied by Philip Hammond (9 August). And, to give a full sense of the scale of the problem, what better source to invoke than the Good Book, as Nigel Farage did with his slightly tautological ‘exodus of biblical proportions’. The use of these words contains a fairly obvious key to the user’s position on the matter and may, as many suggest, affect (and infect) the nature of the debate. Something similar happens to the words used to describe the people making these journeys, which have long shed the neutrality they may once have had in their dictionary definitions. The Oxford English Dictionary (OED), for example, defines a migrant as ‘a person who moves temporarily or seasonally from place to place; a person who moves permanently to live in a new country, town, etc., esp. to look for work, or to take up a post, etc’; a refugee as ‘a person who has been forced to leave his or her home and seek refuge elsewhere, esp. in a foreign country, from war, religious persecution, political troubles, the effects of a natural disaster, etc. ; a displaced person’; and an asylum seeker as ‘a person seeking refuge, esp. political asylum, in a nation other than his or her own’. These neutral definitions are often, however, coloured by the words that are used with them – so that ‘asylum seeker’ now is most commonly associated with ‘bogus’ or ‘failed’, ‘migrant’ with ‘economic’ or ‘illegal’, etc. 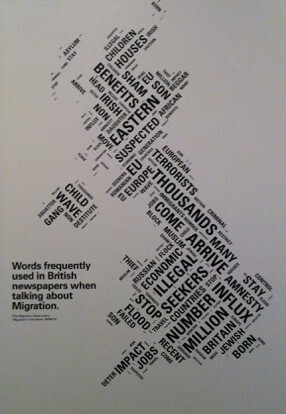 In Adopting Britain, the exhibition to which the Migration Museum Project contributed recently in the Southbank Centre, the Migration Observatory compiled an infographic that displayed the words most commonly used to talk about migrants, refugees and asylum seekers. It was a salutary reminder of the power of media exposure to change the way in which we use words and descriptions. As an illustration of the way in which words absorb associations beyond their literal meaning, Professor Lentin recently questioned whether the use of the word ‘immigrant’ was appropriate when applied to Sir Edgar Speyer in a blog he wrote for us. Speyer was not, as Tony Lentin put it, one of the ‘tired, poor, huddled masses’ most commonly associated with the term although, technically, he was, of course, an immigrant. Politically charged expressions such as ‘economic migrants’, ‘genuine refugees’ or ‘illegal asylum seekers’ should have no part in our coverage. This is a story about humanity. Reporting it should be humane as well as accurate. Sadly, most of what we hear and read about ‘migrants’ is neither. Any modern-day Humpty Dumpty, of course, is free to disagree with this. But then we all know what happened to Humpty Dumpty, don’t we?